Welcome to the Internet's premier guide to America's theme parks and attractions. This guide contains theme park reviews of rides and shows at some of America's most popular theme parks including Walt Disney World, Universal's Islands of Adventure, Busch Gardens and many more. 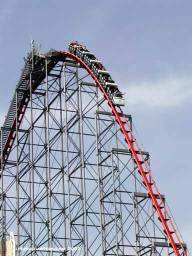 This site is different in that you the user provides insight and ratings for your favorite rides and attractions as well as tips and hints for first time park goers all over the world. This maze really isnt that great, the glass is really dirty and it isnt very challenging. Critic skierman rates it 3 out of 5. Steel Force is ranked #93 out of 2933 rides overall on Theme Park Critic. There have been 85 theme park ride reviews for the ride with an average rating of 4.29 out of a 5.0 possible points. Steel Force has been listed in 76 users top ten lists and has been marked as ridden on 221 of our users ride trackers. 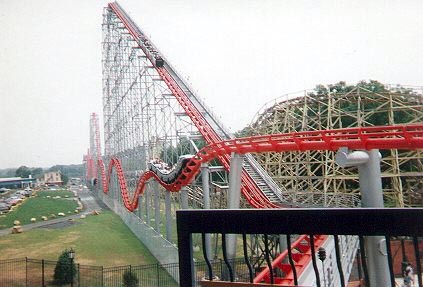 The ride is designated as a "Steel Coaster" and can be found at Dorney Park in Pennsylvania. "You know, one of the things I enjoy as a coaster enthusiast is watching different phases of design sweep over the country. The phases never truly die out (like bad clothing trends tend to), but they ..."
"Steel Force was a very good hypercoaster. The ride, which reminded me a lot of Magnum without the thrashing, was a ton of fun 8) The lift hill is long and the anticipation builds approaching the top...."
"Steel Force, unlike most hypercoasters, is honestly not the most intimidating looking coaster. The first drop appears to be very gentle at the top and the second and third hills’ crests also are fair..."